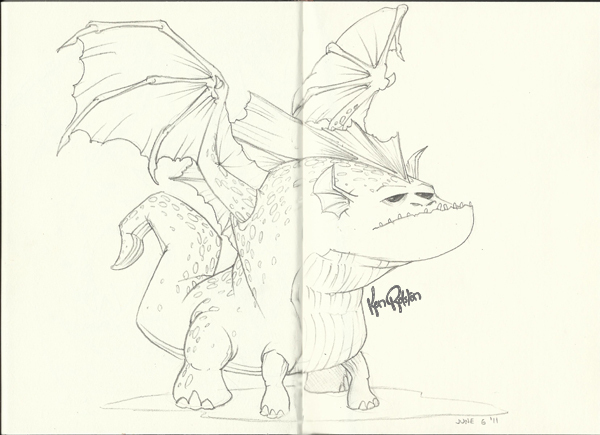 Dragon 115 – I really liked the bulldog aspect of yesterday’s dragon, and I wanted to build on it. But…I wanted to change things up, to stop using a few of my ‘go to’ shapes I find myself using again and again. I tried to change up the feet, opting for four elephant type feet instead of arms and hands. I really had to fight myself to not add in ‘arms’ right up until I scanned this drawing for the blog. Once again, my wife picked the name of today’s dragon. For those of you who don’t follow hockey, Manny Malhotra plays for the Vancouver Canucks. On March 16, 2011 he suffered a serious eye injury that could have ended his career. It doesn’t take much damage to your eyesight to make it dangerous to play at that level of hockey. I used to play hockey with a former NHLer that was released from his team after only a few games because doctors felt that he could seriously injured from a blindside hit. So you can imagine how inspired Vancouver fans were to have Manny Malhotra step back out on the ice for game two of the Stanley Cup Finals! Manny is the inspiration for today’s dragon.